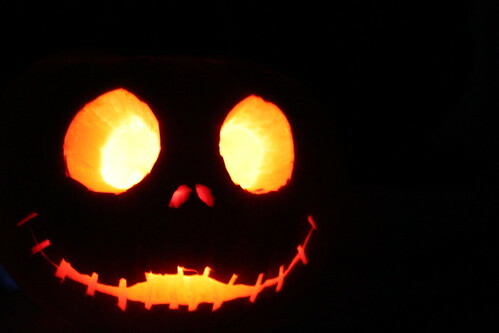 Hope everyone had a great Halloween and that you scored large amounts of candy! 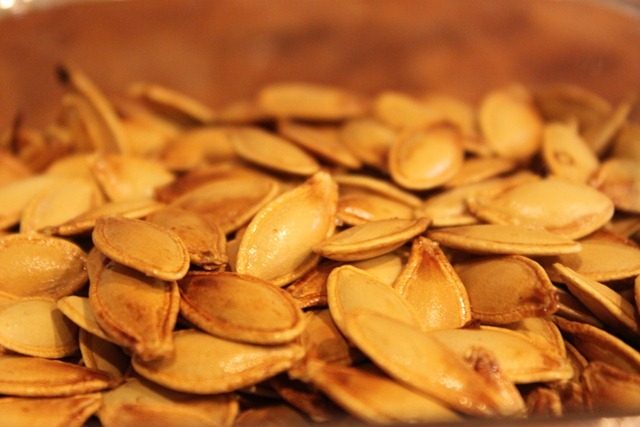 …then burned the batch of Pumpkin Seeds. It was a busy, busy project month and I didn’t even finish everything that I was hoping to. I was hoping to get the tile removed from the fireplace this month and the beadboard installed in the dining room. Both projects have been temporarily put on hold while I obtain some additional supplies. However, that didn’t spoil my fun this month. 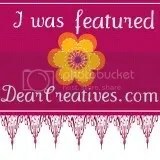 In all, I completed 9 projects/crafts around the house. After the remodel, the laundry became one of my favorite rooms. Unfortunately by the months end the washing machine was broken and I’ve had to temporarily begin using a Laundromat. Even though, I’m not really using the room right now, I still feel happy every time I walk past it. 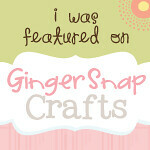 Unexpectedly one of the most popular posts on the site, and one of the easiest crafts. It’s absolutely adorable and the fabric stiffener makes it durable for packing to use next year. 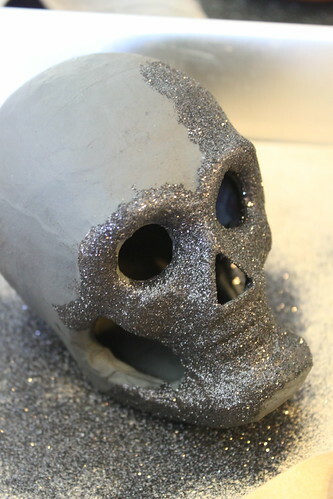 My fun knock off of the more expensive glitter skulls being sold out there. 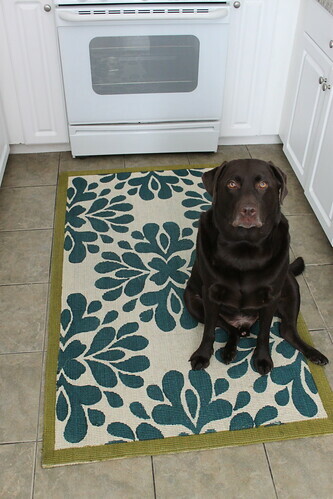 I used a $2 tube of caulking to give some traction to my kitchen rug. Using the vase-in-vase technique and a bag of Candy Corn, I made a simple and pretty floral decor piece. I also shared my Halloween inspired ‘mantle’. This was one of those projects that has been on my list for a while and was free since I had everything on hand. 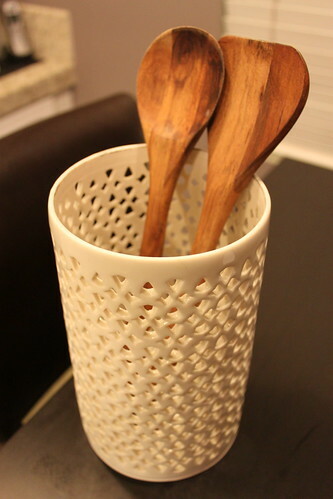 I turned a West Elm candle Hurricane into a functional utensil holder. 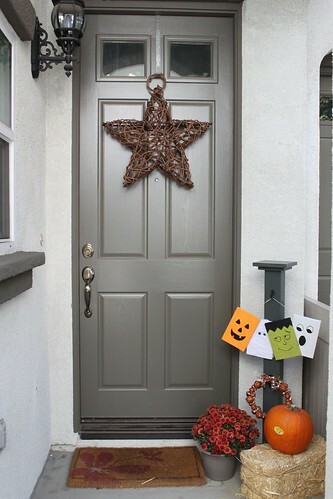 I needed a Halloween sign for my new Front Door Post (below) and this was a fun craft project made out of scraps from the Door Post. 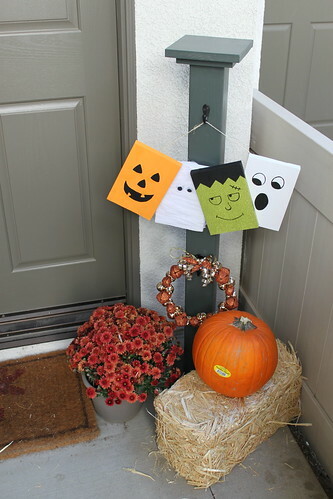 I made a post for the front door to hold decorative signs for the seasons. It was fairly simple to build and has made a huge difference to the look of the front door. Out of everything I did this month, this was the biggest accomplishment. 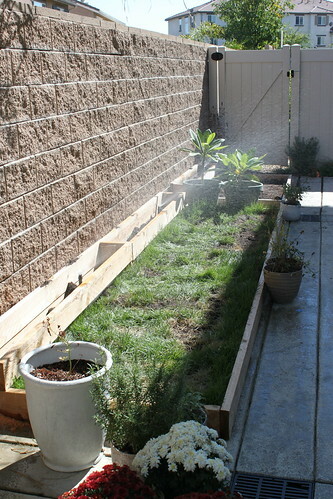 Last month I installed a way to grow grass on concrete and this month I installed sprinklers for those grass planters. Along with the water timer, this has been the best functional project so far. Lots of fun stuff this month, but I have even bigger ideas for next month. Keep an eye out at the beginning of November for a very cool project involving my home’s thermostat as part of the Pinterst Challenge. 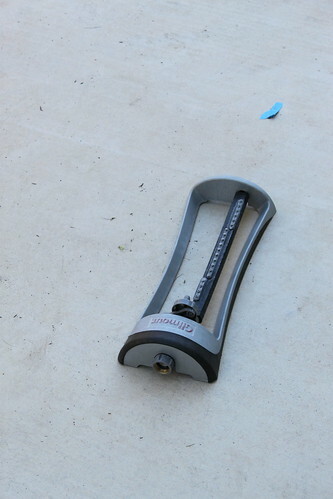 Earlier this month I posted a bit of a teaser about the sprinklers we installed on my cement patio. 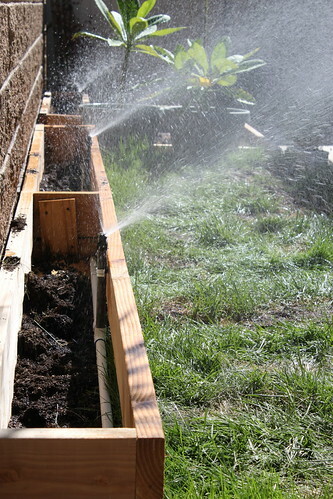 It took a lot of thought on how to make a sprinkler system work in an above ground grass planter. In fact I went through a couple of options that would have been successful as well (just in case you need some options). 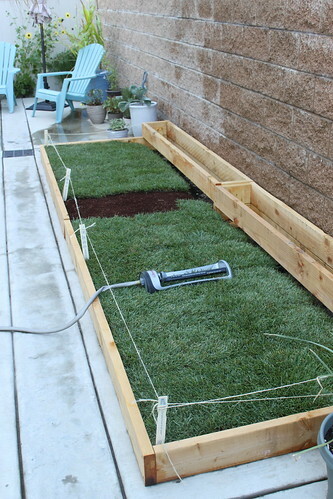 The first option would be to manually water the grass using a hose. 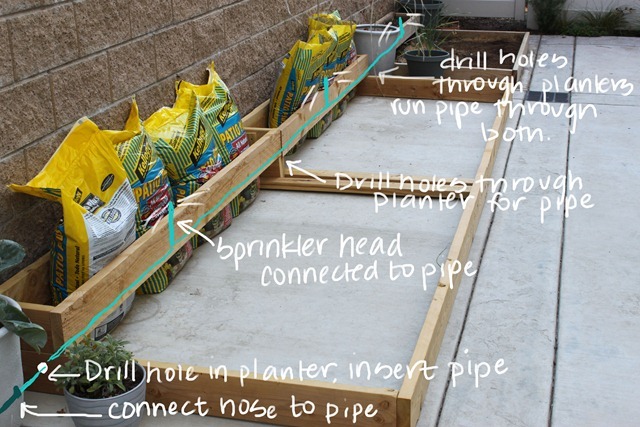 This is not a bad idea if you have other container plants in your yard that need to be watered. It would also work best if you have moderate temperature since you won’t need to water everyday. The second option was to use a traditional above ground sprinkler, like the one below. These actually come in very handy and worked perfectly to keep everything alive when I went on vacation for 10 days (I used a timer, more on that below). You can set it up anywhere you want to best water the yard and it will cover more space than in ground sprinklers. They’re also very fun to run through on a hot day. For a while I used the sprinkler in front of the planter because it hit both planters and the surrounding plants. However, before we considered sprinklers an option, my plan was to run the hose through the back of the planter and set the sprinkler up on the grass. To reduce the amount of overspray, I purchased some marine epoxy at Home Depot. 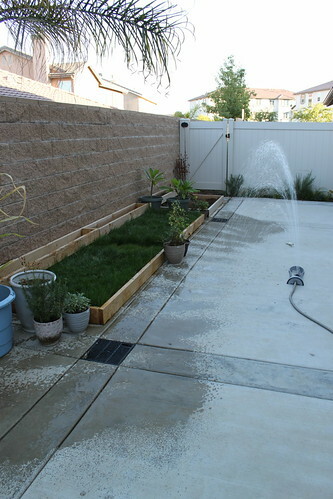 The plan was to fill the sprinkler holes on either end of the sprinkler to only allow the water to eject in the middle, thus only watering the grass and not the wall/concrete. The epoxy plan was thwarted when we came up with the ‘in ground’ sprinkler system idea. While I was a little apprehensive on how it would work, it was incredibly easy…and pretty cheap. Actually it was free for me since my dad had all the scrap supplies at his house; however, I would still say for others it would be a decently cheap project. If you had none of the equipment/supplies at home, it would cost you about $100. I gave my best estimated costs at the bottom of this post. Please forgive the fact that I don’t have a supplies picture for you. Much of the pipe construction was done by my father at his house and then brought to my house for installation. Before I show you the details, here is a diagram of what we did to help you understand. I’ve struggled with how to really step you through the installation, so I’m hoping the above diagram helps a little. If you can’t tell, the aqua diagram is the pipe/sprinkler construction. Please reference the pictures, I’m not sure I was able to capture this best with my words. We ran the piping across the entire length of both planters. 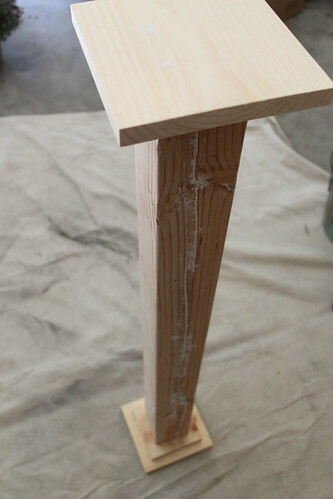 The first step for installation would be to drill holes all across the back. We started the holes on the far left since it was closest to the water source. We used standard white PVC piping, I believe it was 1/2 inch. 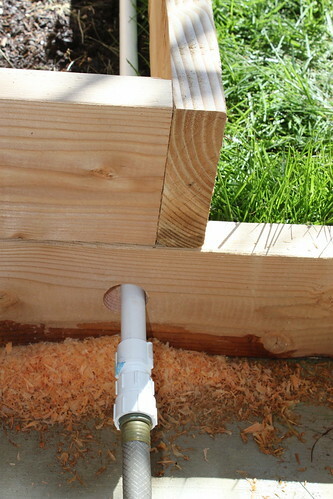 The pipe was attached to a connector that would allow the hose to thread into the pipe, thus allowing the water to feed down the pipe and to the sprinkler heads. 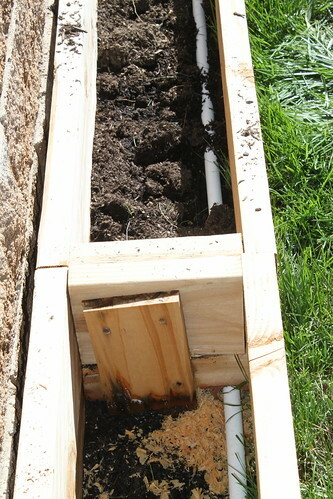 Half way across the first part of the planter we attached a sprinkler head to the PVC piping using a ‘T’ connector. We chose to run them behind the grass because the dirt and flowers would hide them later on. The metal U clamp was not necessary, the dirt held everything just fine. 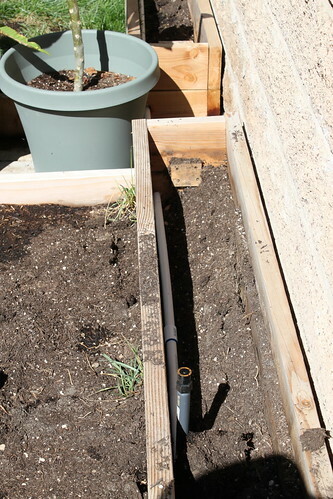 The next length of pipe was connected to the first sprinkler head and threaded through the hole we drilled through the middle of the larger planter. 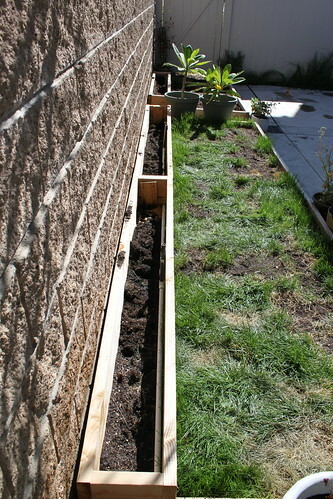 We followed the same steps in the second half of the larger planter, connecting a sprinkler head about half way across, using another ‘T’ connector. 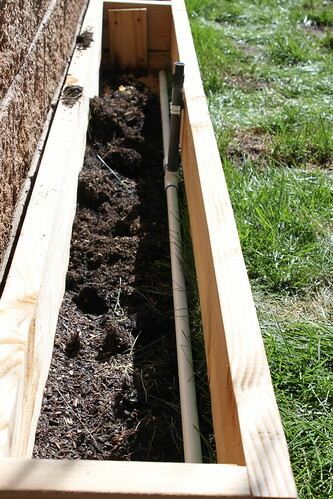 Then we ran the piping through the right side of the larger planter and straight through to the smaller planter. 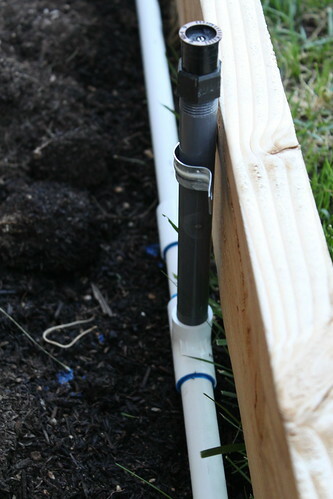 Yes, the piping shows if you look between the planters; however, this allowed the hose pressure to water both planters without a second water source. The pipe is easily hidden by a large pot. The same process was followed for the last, smaller planter. We ran the piping half way across the planter and installed a sprinkler at the end, using an elbow connector. 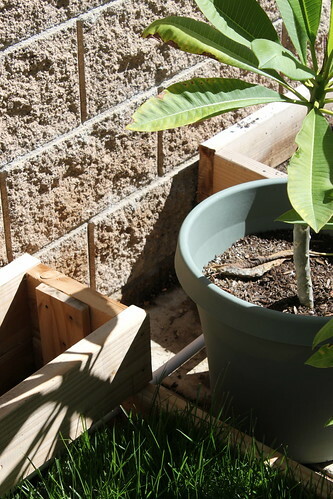 There was no need to extend the pipe across to the other side of the smaller planter. Once everything is installed and dry we turned on the water to test it out. I can now use the sprinklers to water just the grass and a few small container plants around the edges. I’m no longer wasting water on the cement or the wall, which will save me on my water bill, and piece of mind. 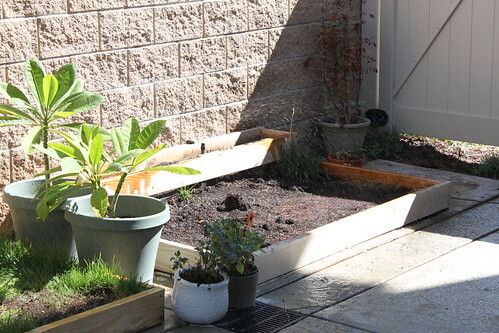 I still need to plant grass in the last planter, but once I do, the water will keep it alive. The dog will probably kill it shortly after. Now, I mentioned a water timer at the top of the post. For those of us that do not use in ground watering systems, you can still use a timer. The timer connects directly to the water source and can be set to go off at any time and up to several times per day/week. The timer runs off batteries. 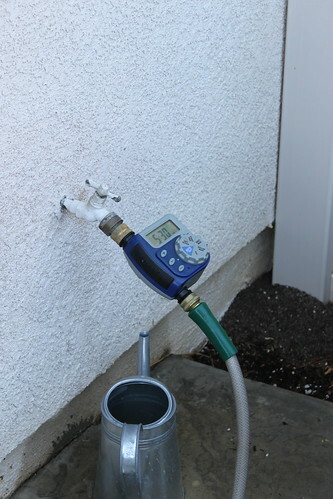 If you want to run two hoses off your water source, just purchase a ‘Y’ connector and hook the timer to one end and a separate hose to the other. 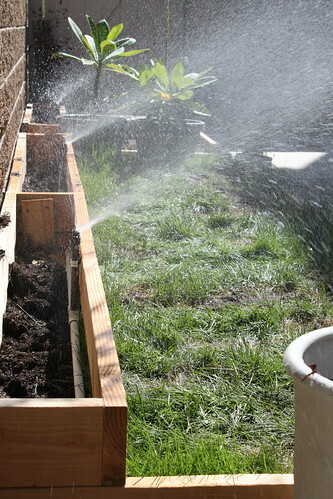 That way you have a dedicated water line to your sprinklers and a separate hose that you can use in the yard. Now that I’m done blabbing about my new sprinklers, let me say that I’m not a sprinkler expert in the least. Nor am I a landscaper or anything else remotely related to an expert in this stuff. This was all new to me and I honestly walked around asking my dad to hand me the blue goop (thread sealant) and the cutter thingy (pipe cutter). I feel like I need to say this because this process may not work for you. You may need to make adjustments to fit your situation and an expert may be necessary. While I’m happy to make suggestions & share ideas, I am not an expert. Safety first people! 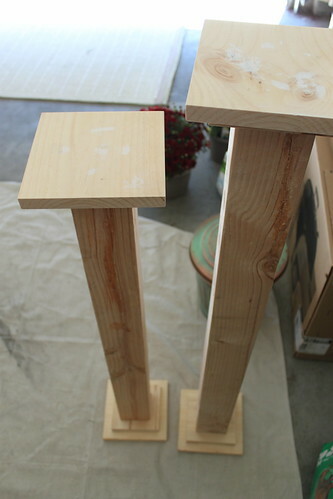 One thing I’m always looking for when reading DIY blogs is not necessarily how to do something. I’m usually more interested in how much it cost. If it costs too much, I will likely look elsewhere for another solution. So while I don’t have the exact costs since we used mostly scraps, I’ve outlined an estimate of how much this would have cost if I needed to buy the supplies. I’ve also included costs of items you may already have in your garage, such has spade drill bits and pipe cutters. I’m hoping this will give those out there with concrete yards some encouragement to do something new and fun. You aren’t stuck with concrete, just try to think outside the box for a unique solution. It’s been a little while since I posted a recipe, so I thought it was only fair to bring you the good stuff today. Plus, it’s Friday, so I’m in a giving mood. This is actually a first for me on several fronts. 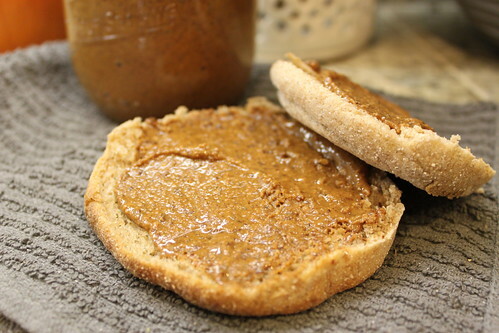 It’s the first time I’ve ever eaten Almond Butter and the first time I’ve ever made it myself. But I have to admit this turned out much better than I expected it to be. 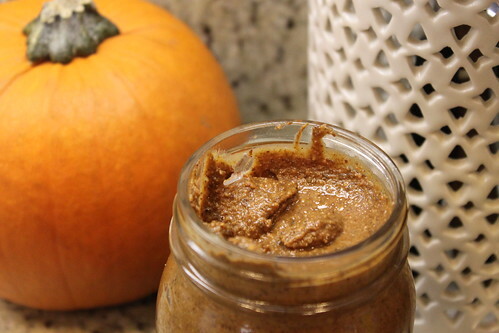 It’s thick and slightly crunchy with a sweetness and the spiciness of Pumpkin Pie. 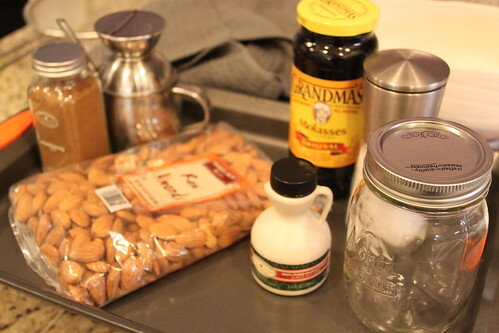 In reality, there is no pumpkin in this, it’s just almonds and a few extra ingredients. I took inspiration from this pin, and tweaked it just a bit to fit my tastes. 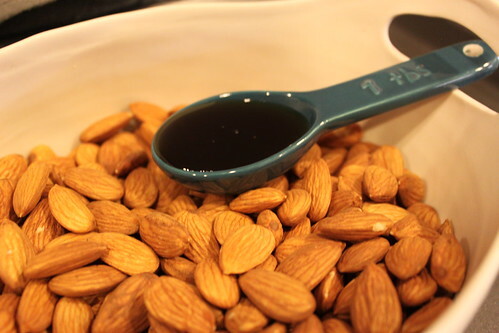 Combine the Almonds with 2T Maple Syrup and 1T Molasses. Spread out on a nonstick baking sheet in a single layer. Bake at 300 degrees for 25 minutes, stirring twice. 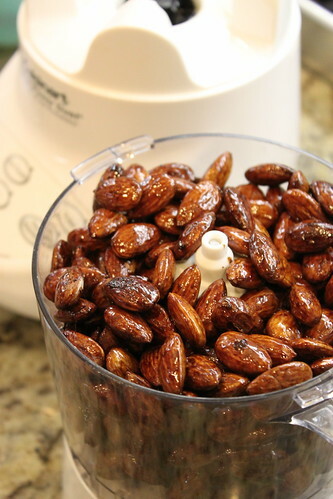 Add cooled almonds to a food processor or Vitamix and process for about 10 minutes. 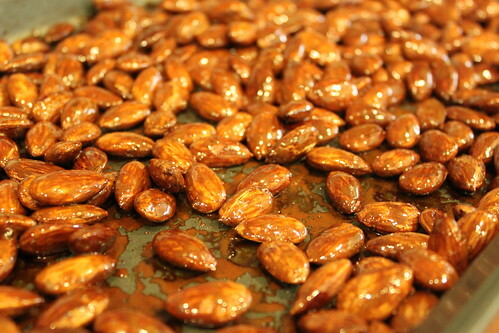 Once the almonds had broken down to a powder I split the batch in half and processed the first half. 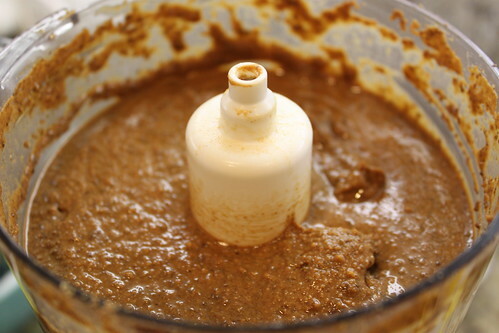 Once it was becoming smooth I started adding spoonfuls of the remaining almond powder. 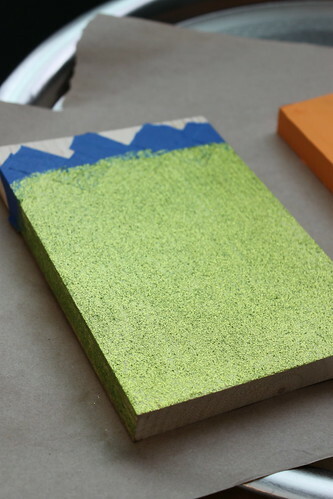 It will fully incorporate but you’ll be left with a slightly crunchier finished product this way. If you have a larger processer you can process it all in one batch. 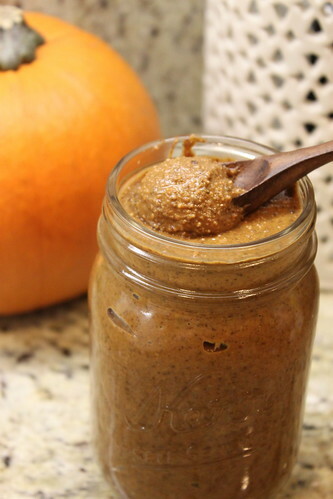 After all the almond powder is incorporated, add the remaining 1T Maple Syrup, Pumpkin Pie Spice, and salt. 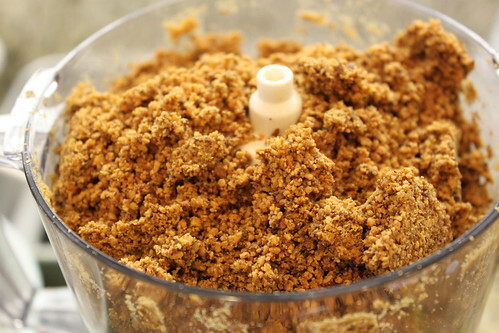 The almond mixture will be crumbly and dry at this point still. Add the lid back onto the processer and turn it on. While running, stream the oil in slowly, use as much or as little as you need to fit your tastes. 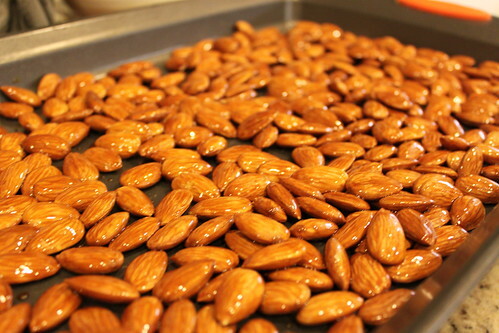 After a few more minutes the almonds will completely ‘butterize’. 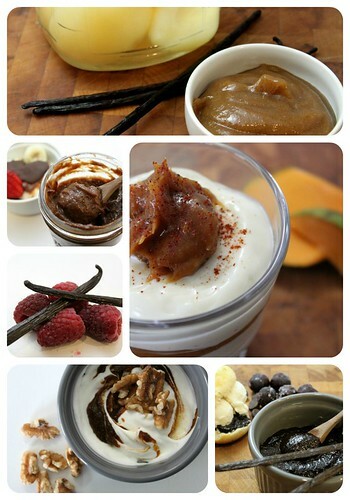 Add to sterilized mason jars and enjoy. Try not to eat it all in one sitting. I was going to wait until after the first of the month to share this with you, but I reconsidered when I thought perhaps you may want to join in as well. So I wanted to share one of my November goals with you a little early. To participate and WIN NaNoWriMo. To clarify, there is no ‘one’ winner to NaNoWriMo. If you hit the goal, then you Win. I plan on winning big this year! Every year I participate in NaNoWriMo, and I’ve never won. Now this is no fault but my own; however, the whole point of this blog is to help motivate myself (and maybe a few others) to take action in life and make those dreams you’ve held onto a reality. If you’ve ever considered writing a novel or any type of book, this may be a fun challenge for you. If you’ve never heard of NaNoWriMo, it’s National Novel Writing Month, held every November, hosted by the Office of Letters and Light. The Office of Letters and Light is non-profit that runs several other writing programs such as: ScriptFrenzy (held in April), and Young Writers Program (2700 schools are participating this year). More than 250,000 people around the world will take part in the NaNoWriMo challenge this year to write 50,000 words in 30 days (about 1700 words a day). It’s FREE to anyone who wants to join in. You’re writing doesn’t have to make sense, just get it all down on paper. Don’t worry about grammer, plot points…JUST WRITE. So if you think you might be interested in trying your hand at starting your first novel/story/book, sign up with me, here! When you sign up make sure you set your region, there will be plenty of writing groups meeting in your area next month! If you find your the first in your area to sign up, start your own group and spread the writing love. Have you ever participated in NaNoWriMo? Will you be joining this year? I’m currently doing my Civic Duty at the (not so) local courthouse, which means I’m sitting here doing a lot of nothing. They don’t have any trials on the calendar right now, so we are just waiting. Here’s hoping that they let me go at 11:30am. Luckily I brought my computer with me and they have free WIFI (although my phone is sadly still sitting in my car). So in the meantime, I wanted to share an update to one of the October monthly goals. The people sitting behind staring at my screen are going to get a kick out of this. (Maybe they can’t tell I can see their reflection in the screen…hmmmm) Well,if they read that, they probably do. 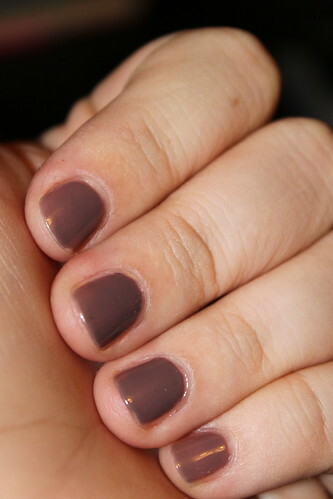 One of the goals that I had set for myself this month was to stop biting my nails. At the beginning of the month, I cut them all down and gave myself a manicure. I figured if they looked nice, I might be less inclined to bite them. The problem with that logic is that I don’t intend to bite them, it just sort of happens, then I realize it later. However, I’ve been really REALLY good this month. I was so smitten with the silver tips, I did them again. However, as soon I sat down in the jury room they started chipping, bummer. Luckily I can fix them at home since I do all my own manicures. I have to say that I’m really proud of myself on this challenge. I haven’t bitten a single nail, even when one broke in the middle of the day. 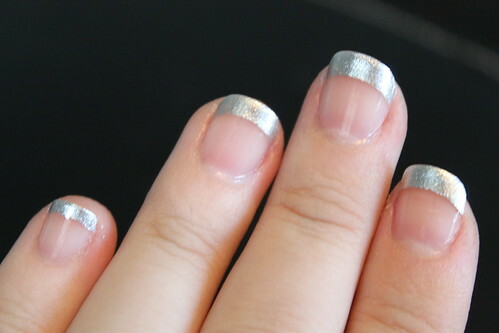 They are stronger, longer, and I feel so much prettier having longer/polished nails. Don’t bother with the bitter nail crap, especially if you cook. 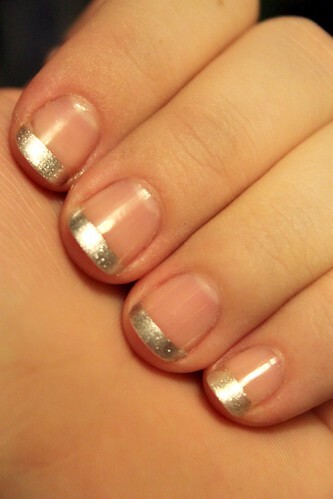 If you ever cook or eat finger food it will make everything taste terrible, not just your nails. Keep hand/cuticle lotion with you at ALL times. As a mind game, I placed a rubber band around my wrist and snapped it every time I caught myself starting to pick or bite. I don’t know if this worked, but maybe with more time I would associate nail biting with pain and stop subconsciously biting. To fully break a 25 year habit, it’s worth a try, but it will take longer than a month. What Bad Habit are you trying to give up? I love wreaths, but I also like fun holiday themed hanging signs. This is a problem because I only have room for one on my door. If I have a wreath on the door, then where do I hand the cute little holiday sign? Why am I telling you this? I get it, you probably don’t really care about my door/wreath issues. Well, I finally found a solution and it cost less than $15 to build myself ($30 if you include a set of countersink drill bits that I needed anyway). Now I can hang all the holiday signs that I want and it won’t get in the way of the lovely wreaths. I don’t have a picture off all the supplies like I usually do since I was kind of making this up as I went. However, I have it all priced out at the bottom of the post. 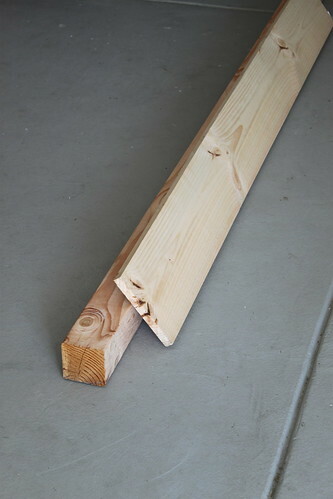 Visit your local lumbar yard and pick up some basic lumber. I bought the cheapest stuff they had since I knew I would be priming and painting it later. If I had been staining the post, I probably would have picked something else. Like I’ve done with other projects, I sweet talked my dad into making the major cuts for me. He has all the tools in his garage and can make them so quickly. There are two sets in the picture, because I made a post for my mom. Both posts came from the same boards so we were able to split the costs. 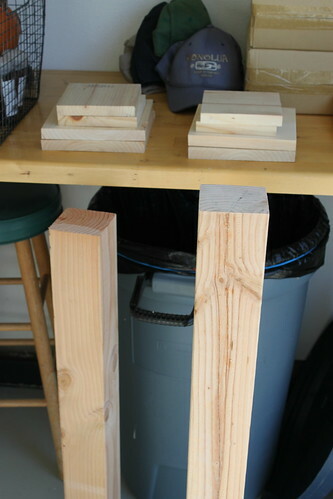 Your exact measurements can vary so don’t worry about screwing it up. We cut my moms post at 3 feet and mine at 3.5 feet. For the smaller boards, we just cut off 4 squares in each size. 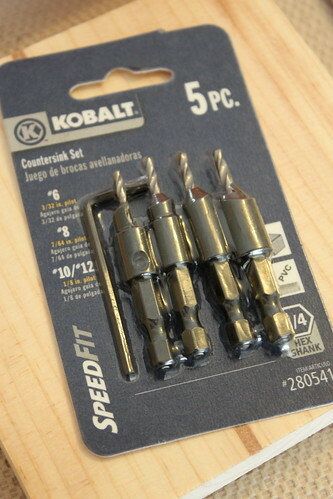 One thing I did need to buy was a Countersink Set (from Lowes). Now I can countersink all the stuff I want; even if I were to break off a drill bit into the wood the first time I used it. Not that I did that. I took the smaller square and countersinked (is that a word?) 3 screws. [the fourth contains the already mentioned broken drill bit]. I did this on both ends. Usually you would want to fill these holes, but in this case they will be covered with the larger square so you’ll never see them. 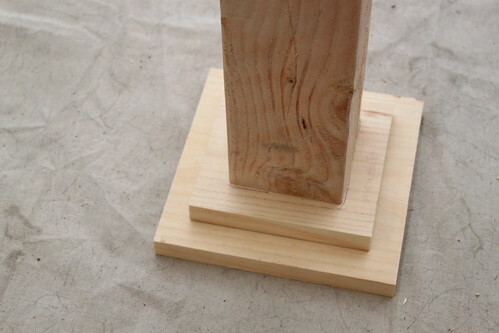 Attach the larger square using nails. I used 2 inch finishing nails and then set them. 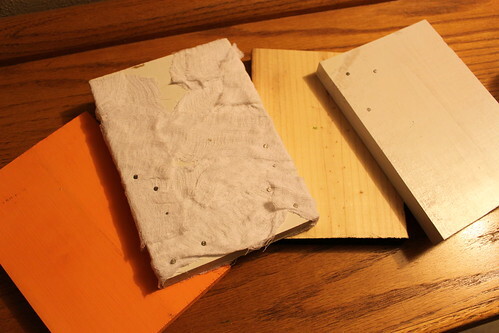 Fill all nail holes with wood filer. 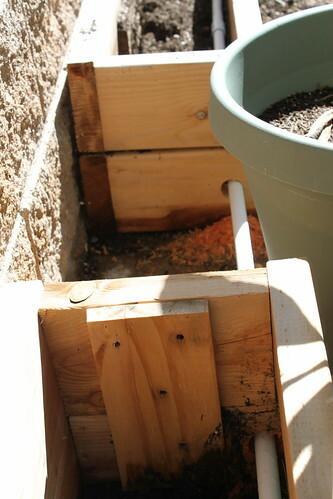 Then I filled all the other holes, knots, and cracks with wood filler and sanded the crap out of that thing! Prime the post. I used some leftover interior Kilz since it’s what I had on hand. 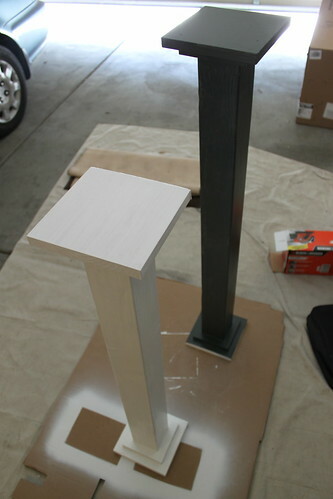 It took 2 coats on each posts. Next up, PAINT! I used some leftover interior Satin paint that I had on hand. While the post will be outside, it is shielded from rain, etc. So I wasn’t concerned about having exterior paint or Poly on it. 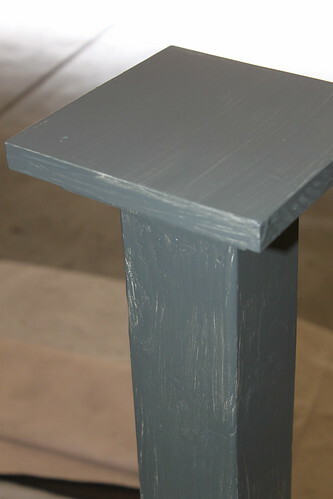 Each post needed 2 coats. After the final coat was dry, I added basic black robe hooks. Mine has two and my Mom’s will have just the top hook since her post is shorter. Very easy and so much fun. 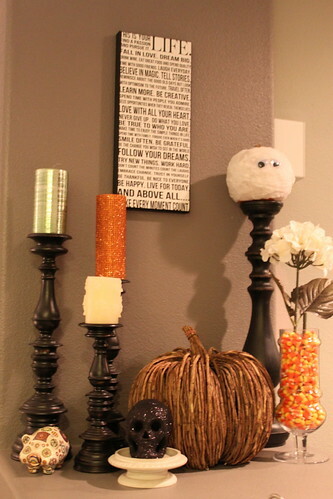 It can be left out all year round and I can just change the decor with the holidays/seasons. I already have a very cute setup planned for Christmas. It would have cost under $15 if I didn’t need to buy the Countersink set, but that will come in handy for future projects. A great investment to my tool kit. 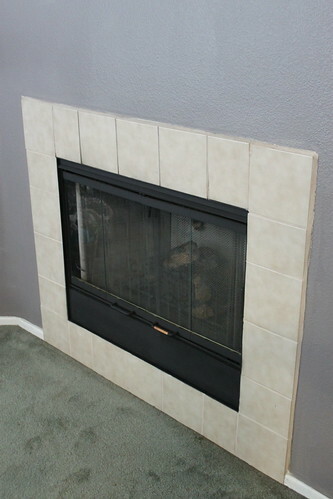 One of the big Fall/Winter projects I have on my plate is a fireplace remodel. You can see in the picture below that the house simply had a tile surround. No mantle. It’s builder stock and it’s ugly. So far I’ve painted the fireplace screen, and there is no more brass. 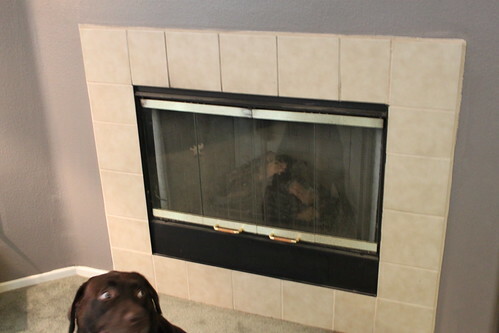 You can see the details about painting the fireplace screen here (it cost less than $5). I still need to do a lot to get the fireplace in shape, especially since I would love to have it built in time for Christmas stockings to hang on. In the meantime, I spend hours searching for inspiration throughout the internet and magazine. These are some of my favorites that I’ve found online. 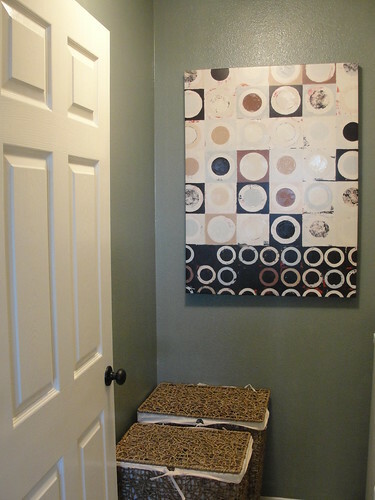 This first picture is most like what I expect to do in my own place, only with different tile colors. Let me clarify, I don’t actually want a new washer and dryer (well, maybe a little). However, my appliances are rebelling. First the air conditioner and now the Washing Machine is broken. It’s a cheapo that came with the house, and fixing it will cost several hundred dollars. I still need to do some research, but I think it might be smarter to replace them than to fix the issue. This Etsy seller turns stunning vintage (and vintage looking) books into working iPod docks. 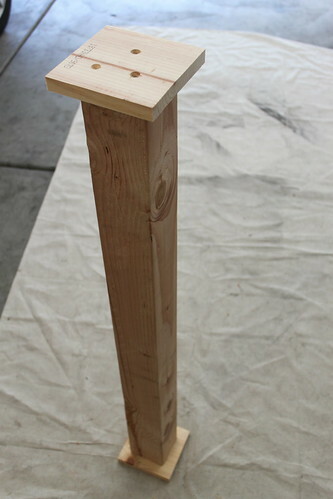 It’s rather ingenious and would look so cool on a bookshelf or nightstand. Oh all the uses I could find for this glassware. It’s chunky and smooth, lovely in every way. I could see myself using these to serve OJ in the morning, or as vase for fresh cut flowers, or fancy up the vodka at a dinner party. 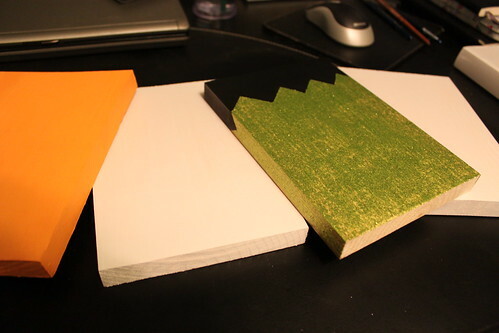 For anyone that loves the traditional Moleskine notebooks, this is for you. Maybe it’s all the amazing writers that have used these notebooks in the past, but just owning one makes me feel more eloquent & artistic. It’s a very classy way to carry your notebook, and would make a great gift for that stylish person in your life. 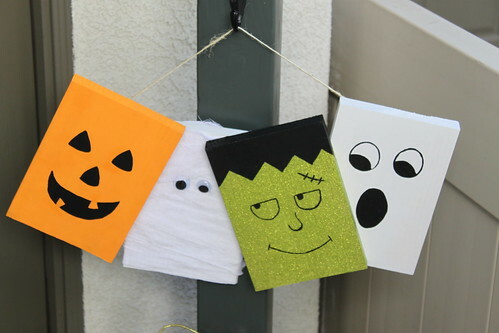 Out of the all the holidays each year, Halloween feels the most like a crafty holiday. 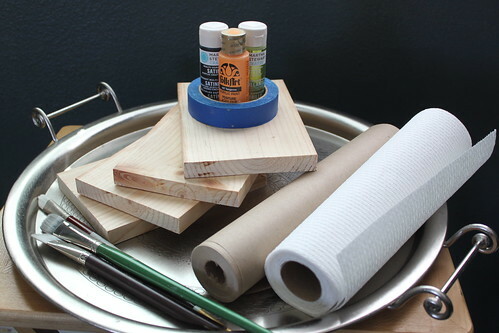 I always have the urge to break out the paint and scrap wood/canvas to create a fun/spooky project. This year I needed a Halloween sign to hang out by the front door. A little paint and cheesecloth goes a long way. 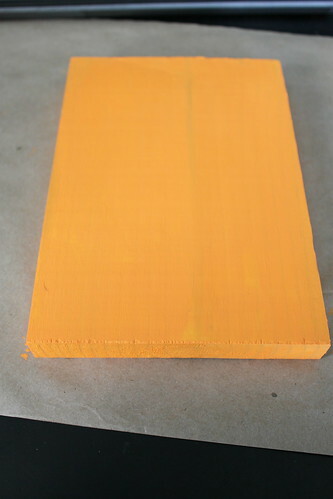 The first block should be painted Orange, and will later become the pumpkin. I did 2 coats of Folk Art in 627 Tangerine. 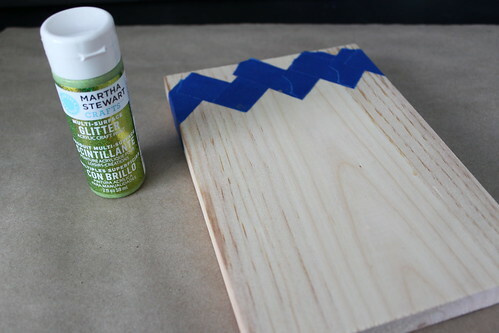 You don’t need to paint the back of the boards, but make sure you paint all sides since those will be visible. Tape off the top of the block since that will be painted black. 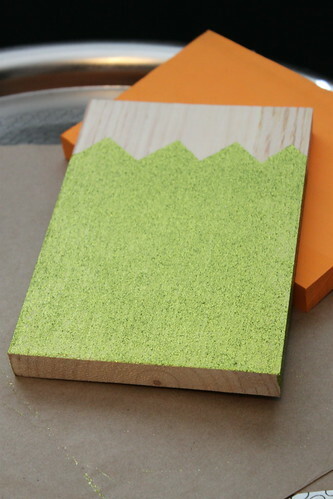 I used Martha Stewart Craft Glitter Paint in 32169 Golden Beryl. 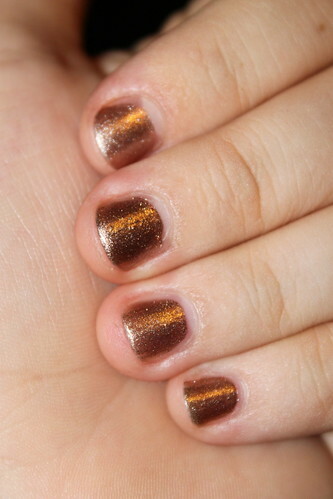 It took 3-4 coats of the glitter in order to achieve full coverage. 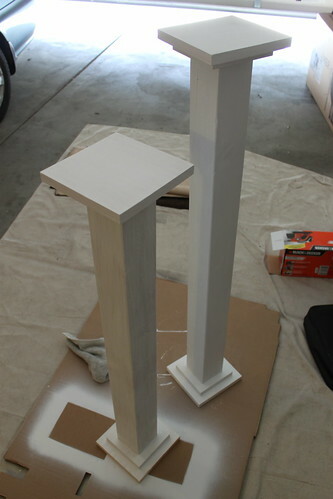 The last two block should be painted white. One will later become the ghost and one will be the mummy. I used white spray paint for both of these and unfortunately it was too dark in the garage to take any pictures. 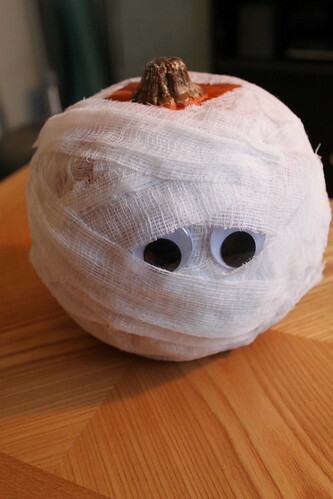 You can use this tutorial on how to use Cheesecloth to make a mummy. Using black paint, I free hand painted all the faces. 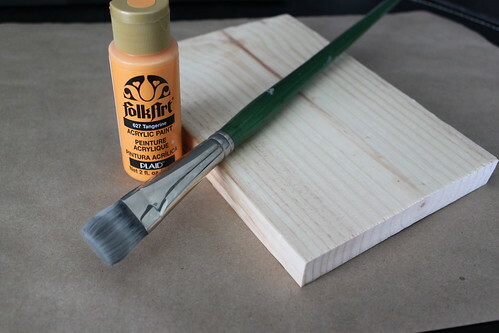 You can use a pencil to sketch the design directly onto the wood first then paint over it. 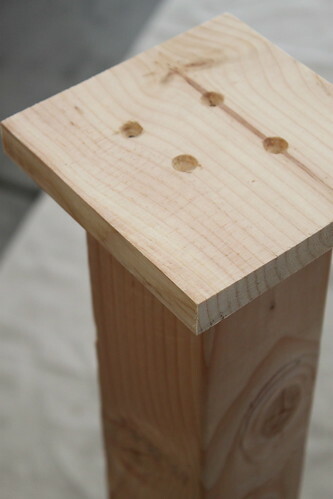 Attach the block together using wood glue and nail. 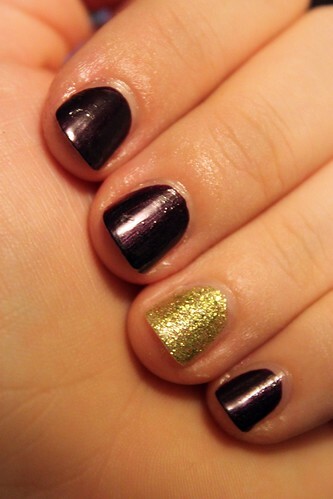 This may go without saying, but make sure you check the thickness of the wood when selecting your nails. It was difficult to pick a size that would make it through the first block and not the second. 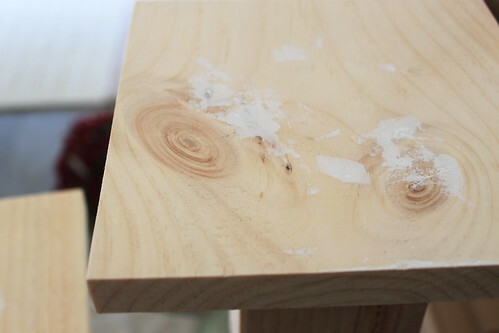 This is why I used the wood glue, just to give a little extra hold. Attach a piece of twine to the back, using a staple gun. 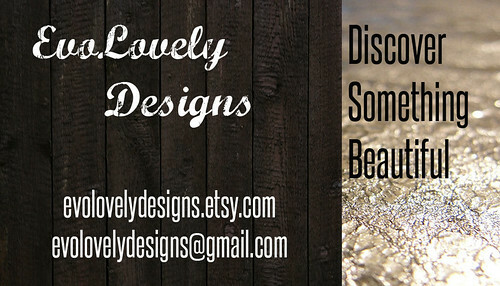 I hung the sign from a front door post that I’ll be sharing in a separate post soon, but you could also hang it from a standard door hook and it would look great.